The panel answers questions from a packed audience at the Glencairn Centre. 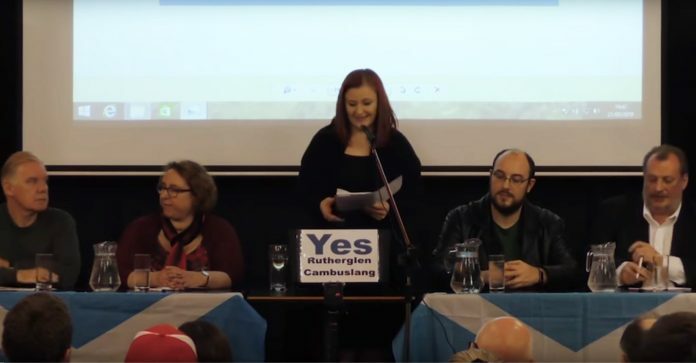 Yes Rutherglen and Cambuslang held a Question Time-styled panel at the Glencairn Venue in Glasgow on the 21st March 2019 to discuss the way forward to IndyRef2, the legal and political issues, and how we win. Panel members were Bill Bonnar (SSP), Kirstein Rummary (Stirling University), Craig Dalzell (Common Weal), and Lindsay Bruce (ayeMail). Chaired by journalist Angela Haggerty. Although quite long at 1.5 hours there are many very interesting answers to some of the questions. Much better use of time than watching old fims on television. The event was filmed by Newsnet media associate, Twinlaw Films.